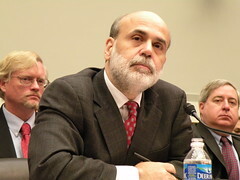 Image by talkradionews via Flickr Amidst his hectic schedule managing the ongoing credit crisis, the New York Times notes that Federal Reserve chairman Ben Bernanke opened a bipartisan symposium which will, “lay the groundwork for what leaders of both parties predict will be a major push for health care legislation next year.” From the article, it seems that since healthcare accounts for such a large (and growing) slice of the federal budget pie, fixing inefficiency and disparity in healthcare will assuredly involve more legislation and regulation on a growing scale. The article bummed me out since I suppose it portends new and shifting regulatory layers that will just make it harder for entrepreneurial consumer-driven and health2.0 innovations to establish themselves. Coincidental bummer that this symposium was taking place on the day NY and CA were stifling a new genetic testing industry.